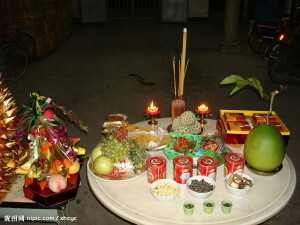 One of the oldest ways of celebrating Mid-Autumn Festival is to make offerings to the moon. Originating from prehistoric adoration of Nature that spread from the imperial court to folk custom, moon worship has been personified through the ages into Daoist gods, Chang’E, Yutu (you can read about the legends here http://snowpavilion.co.uk/how-change-yutu-reminds-us-that-china-needs-more-space/), Yue Gu and Yue Liang Niang Niang (Lady Moon), Yue Po (Grandma Moon). The most common types of offerings are fruit, such as pomegranate, dates, pomelo, watermelons, peaches, apples, with their seeds a symbol of fertility. Each fruit comes with lucky puns to their name in Chinese. Unusual offerings include green beans from Shangdong and Mao Dou (edamame beans) from Shanxi, where people believe these are Yutu’s favourite foods. Some regions such as Guangxi and Zhejiang offer up rice noodles and lucky red eggs, while Tianjin offers ginger flowers, radishes and Guizhou sunfowers. In other words, whatever is a regional speciality and windfall. 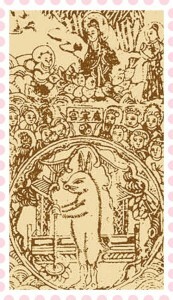 In the old days altars were also decked with paper offerings made from moon paper. Moon paper, which appeared during the Ming Dynasty, comes in red, white and yellow, some with multi-coloured wax-dyed edges. 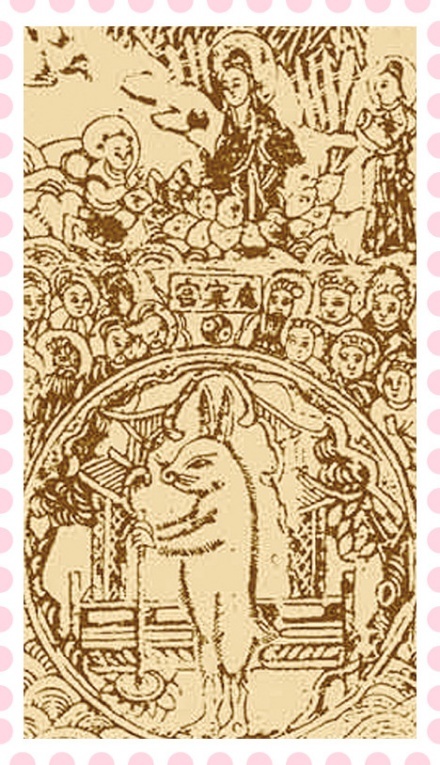 Wood-cuts of Daoist, Buddhist deities, the moon palace, the medicine-making Yutu and gods of fortune, were printed onto moon paper, which were then folded into horse shapes, a practice carried over from the obsolete use of horses as sacrificial animals. As late as the 1950s, you could still buy moon paper offerings from convenience stores in Beijing. Wooden figurines of the moon goddess also appeared on the altars, as did metre-high moon towers upon which offerings were laid, crafted especially by paper craftsmen in Hubei. Lighting incense, families would bow before the moon and pray for their loved ones to be well and safe through the seasons. 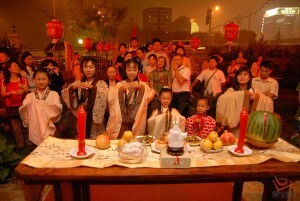 It’s true that in some regions, women pray to the moon goddess alone, to wish for their hearts’ desires, but contrary to popular belief, it isn’t just women who worshipped the moon, in some areas of Henan, Jiangsu and Shanxi men were the ones meant make the offerings. 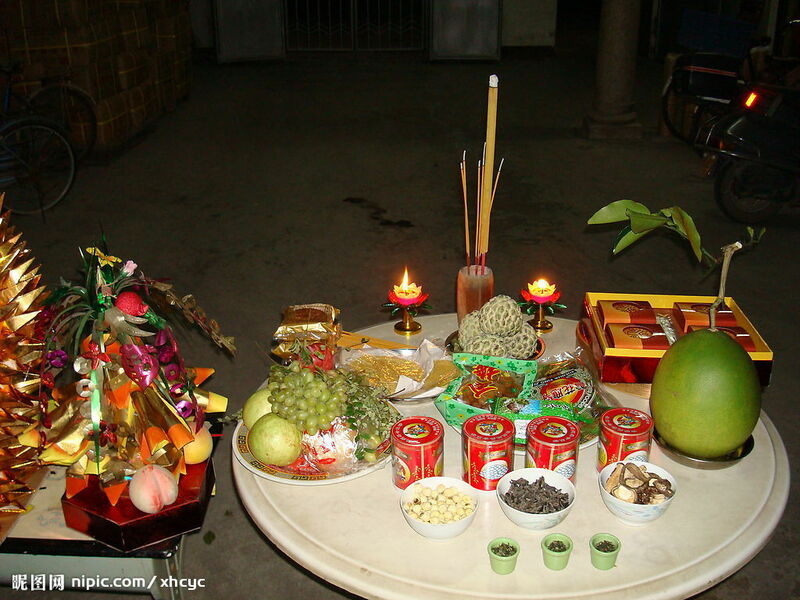 Apart from main offerings made to moon deities, there is an array of other gods who also receive less elaborate offerings during Mid-Autumn Festival. This includes one’s ancestors, household gods, gods of the earth and farming such as Tu Gu and Tian Zu, and Hu Shen, god of the lakes, whose tribute is an also quite spectacular, an altar of animal and wine offerings on a boat accompanied by firecrackers. On Mid-Autumn Festival, it’s important to be out at night in the moonlight, whether you’re in your back garden, out on your balcony, or just strolling the streets. 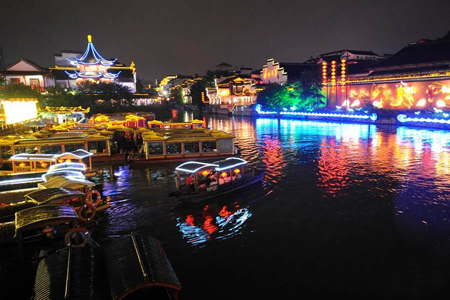 Parks usually hold events with late-night openings, such as lanterns with music, as do natural heritage sights with plenty of mountains, lakesides, boats in which to enjoy the view. 赏月(“Shang Yue”), moon watching, or moon appreciation is a key part of the activities. It is said that the moon is at its roundest of all year on Zhong Qiu, ideal for enjoying 月华(“Yue Hua”) or Moon Glamour, the multi-colour clouds that surround moon at this time of the year that first inspired the legends of Chang’E and Yutu. 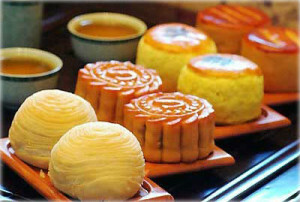 As you may know, the most famous food of Mid-Autumn Festival is 月饼(“Yue Bing”), or moon cakes. 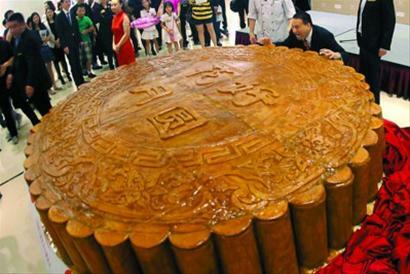 The existence of moon cakes were first recorded during the South Song Dynasty. 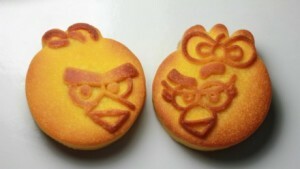 Rebels of the Yuan Dynasty like Zhang Shicheng were said to have inserted secret messages into the filling of these cakes to be passed round as part of the resistance effort. They only became a Zhong Qiu custom during the Ming Dynasty. Moon cakes that were part of offerings tended to be very large, and round to symbolize the moon and union. 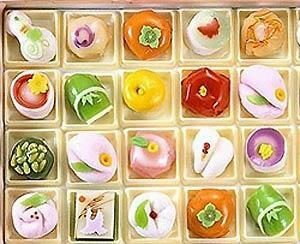 The cakes would be made of dough sometimes dyed red with fruit juice, sugar, osmanthus, inlaid with dates, steamed or baked, with Yutu, Chang’E or the gods of fortune, longevity and happiness printed on them. Usually a family would have one made, and share the pieces between only family members after the ceremony. Today, moon cakes have become very commercialised, a corporate as well as personal gift, they are much smaller and come in every conceivable size, shape, colour and type of outer skin, with not only sweet, but also savoury, even spicy flavours. Suzhou, Guangdong (Canton), Beiing, Ningbo, Chaozhou (Teochew) and Yunnan all have their own styles. Five nuts, red beans, sesame, ham, green tea, cheese, lotus, taro are just a fraction of the filling available. I have posted some pictures to show the variety at the end of this article. Other important foods are of course, the Mid-Autumn family reunion meal. Delicacies differ across the country, with a common feature of moon-shaped pancakes. 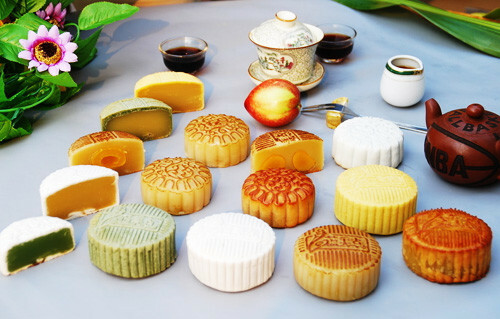 Baked dough pancakes are eaten in Beijing as the staple, whereas Jiangsu people emphasize making the pancakes themselves, whilst in Sichuan steamed sweet pancakes are made from glutinous rice, wheat ones with savoury toppings are taken in Shandong. As Zhong Qiu is a time when the osmanthus blooms, osmanthus wine is a popular festive drink. 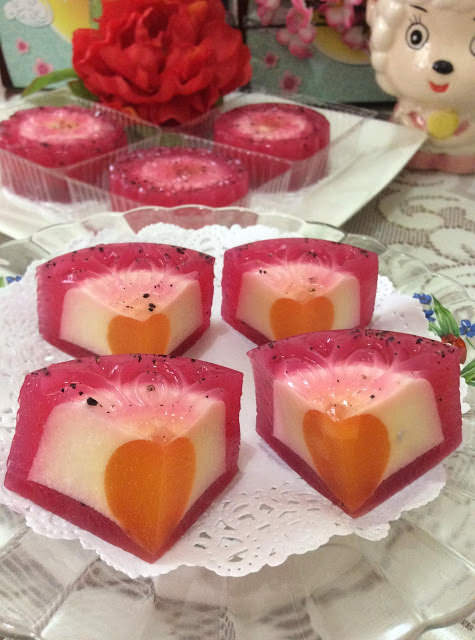 Copious amounts of fresh fruit are consumed, the taste of Mid-Autumn. Snails are fat during this season, a favourite of the Cantonese, the culinary adventurists of China. 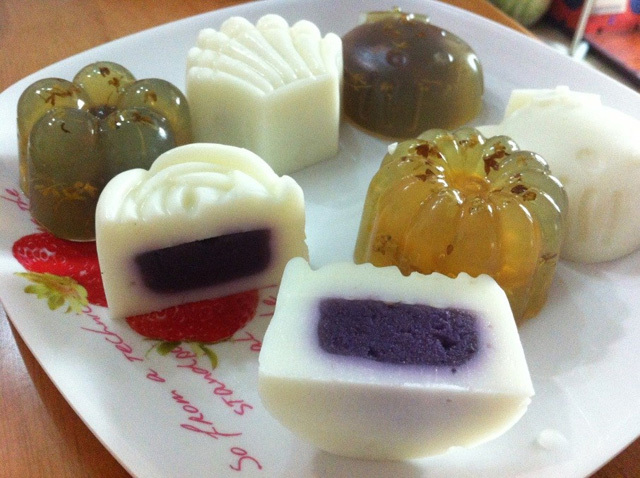 There is also a custom of taro eating in Guangdong, which like early moon cakes, was said to have been connected with Yuan resistance. 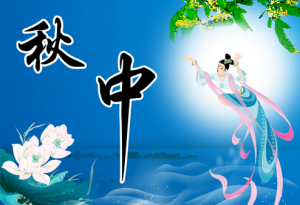 Traditionally Mid-Autumn was a time for women to enhance their procreative powers. In the old days, women went out “moon walking (not the backwards version)” or “moon stepping” with their friends on the streets and to temples. Young wives who were unable to conceive would go out to steal vegetables, gourds and melons from other people’s fields and gardens, a custom called “Autumn Touching”. In Fujian, women stole taro, which must be cooked and eaten under the moon. In Jiangsu, women stole taro specifically from offerings made by others. 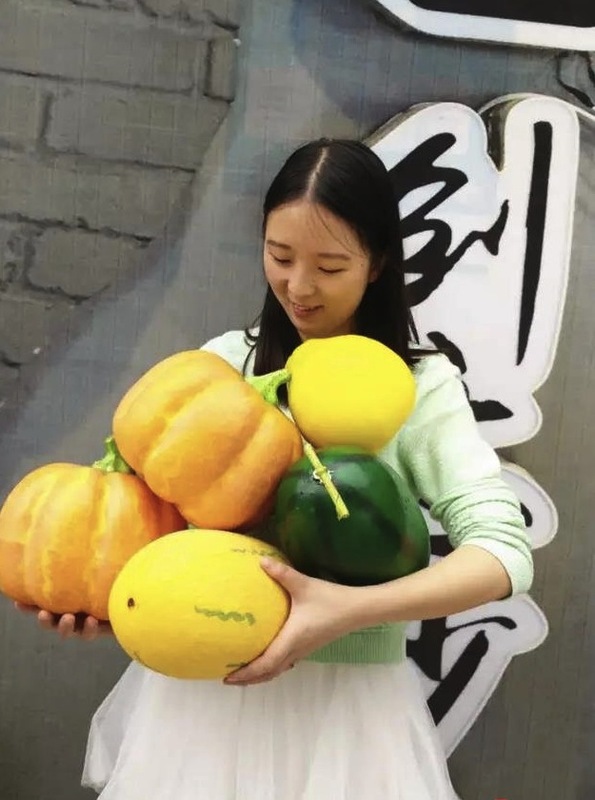 In Anhui, it was the husband who went out to steal pumpkins, in order to “bring home the seed” to his wife who would complete the process by holding it while she slept. Special sanction was granted on this night, no one would complain if they saw their vegetables and fruit being stolen on Zhong Qiu. Some believed that the remedy would only be efficacious if they are told off by those from whom they were stealing. In parts of Hubei and Guizhou, the thieves deliberately made as much of a ruckus as possible to provoke the owners of the fields, the louder the complaint, the more likely they believed they would conceive. Some would even draw baby features on the melon, or put it in children’s clothes, or even gouge a hole in the said vegetable to place a red chili pepper there, to wish for a son. For contemporary couples wishing for children, I would recommend the moon stepping, but may be not vegetable stealing. Another moon related custom is fortune telling. In areas of Jiangxi, Hunan and Fujian, divination was made by reading the patterns of fish in the lakes on Mid-Autumn, and by the movement of the basket placed in front of the alter to channel the spirit of the moon goddess. Recently in parts of Guangdong, the brightness of the Zhong Qiu moon has even been used to forecast oil prices. In Tianjin, oiled threads were tied to crabs, and the patterns made by the threads from the crawling of the crabs used to divine the future. I have mainly written about the origins and history of traditional beliefs and customs of Mid-Autumn Festival. I hope to have provided some enjoyable reading and to have encouraged in you the desire to celebrate this wonderful traditional Chinese autumn fest. In my next article I will look more at the festive entertainment of Zhong Qiu, old and new.